Steel rebar is used for giving extra strength to concrete and other building materials, but it’s far more versatile than you might imagine. It’s easy enough to bend, shape, and cut it with just a few power tools. If you’re looking to get creative and decorate your yard without spending a ton at the local hardware store for pre-made outdoor accessories, try some of these fun rebar projects yourself. You’ll build useful skills you can use if you ever decide to pour your own concrete slabs reinforced with rebar. 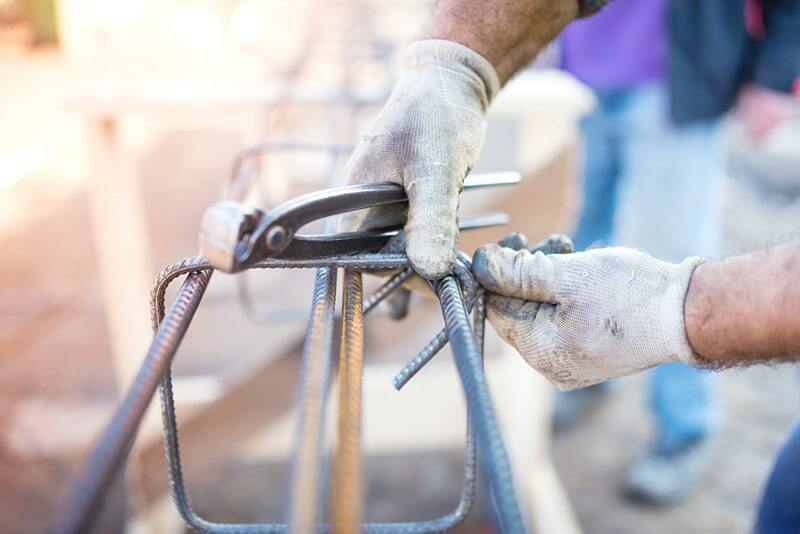 If you’re not sure of the best way to cut rebar and can’t weld yet, start out with an attractive deck railing that combines the steel rods and pre-cut lumber. Build a top rail and vertical support pieces from the wood, then run horizontal lengths of rebar through holes drilled in the supports to create balustrades. You can also stick with vertical pieces too by drilling down through the top bar. Have you ever admired the flowing lines of fencing made from green willow or bamboo? You can weave with rebar tool, if you’ve got some bending tools and plenty of elbow grease. Hammer rebar into the ground at two foot intervals to serve as posts, then run longer lengths of the metal horizontally along the fence line. Start with the horizontal rod positioned behind the first post, then alternate to the front of the next rod, and so on to create a wavy look. You can also try using sheet metal, wicker cane, or other materials as the bending fence material to contrast against the vertical rebar pieces. Give your favorite plants some supports that last for decades, even out in the wind and rain. The simplest design consists of three lengths of rebar tied together at the top to create a triangle shape. To get more creative, bend the rebar into U-shapes or even wavy lines for a more artistic look. 20 foot lengths of metal can be bent into large U-shapes and set up a few feet apart to create a full-sized arch way. It’s perfect for framing the entrance to your garden, especially if you plant vining flowers like morning glories to grow over the frame and cover it. Ready to get welding? With a welder and some cutting equipment, you can turn a salvaged slab of barn wood into a patio table your neighbors will envy. Build a simple frame for the table top by cutting and connecting four lengths of rebar that fit exactly around your wood. Attach a second set of rods, about half an inch smaller than the first on all sides, underneath the edge of the wood to create a lip it rests on. Add four legs at the corners and you’re ready for a barbecue or backyard party. Elevate your humble pots and planters by building a pedestal base that can support their weight with tough rebar. Bend curving shapes from the steel to mimic the lines found in nature, then attach a joined ring at the top that lets the planter nestle down at least half way to prevent tipping. You can also support concrete or resin bird bath tops this way. Consider painting the exposed metal to add a burst of color, or coat the bars in linseed oil to prevent rusting while allowing a natural patina to develop. All five of these projects give you a chance to express your creativity with rebar art. Start out simple, then add more flourishes and twists as you gain confidence with the techniques and tools you’re using. Visit our blog for more tips and tricks regarding construction, rebar, and household projects.